Dr. Sherri Noxel is the scheduled keynote speaker at the 10th Annual Parker Family-Owned Business Symposium taking place on October 21, 2016 at Sandia Resort & Casino. 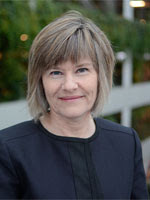 Dr. Noxel is the Director of the Austin Family Business Program at Oregon State University where she teaches Family Business Management and a ten-week course that focuses on the opportunities and the problems characteristic of family businesses. For more information about the event and to obtain tickets, please click HERE.